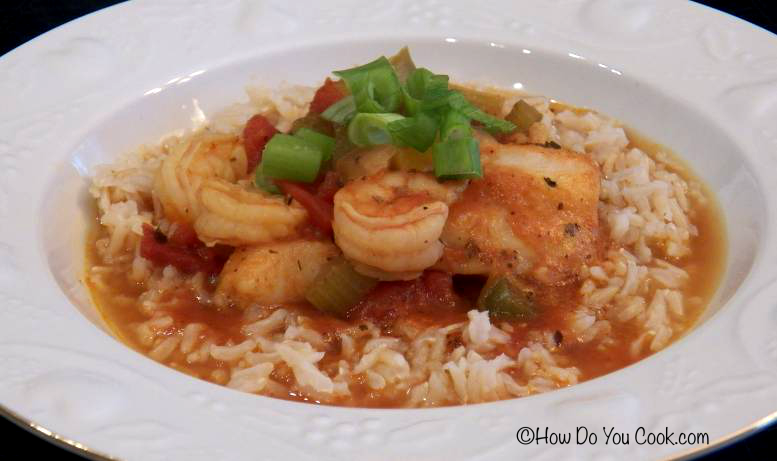 For day #7 of Soup Month 2012, we bring you a quick version of Swai and Shrimp Creole Chowder. This mildly spicy seafood and vegetable mixture is served over brown rice and makes a delicious and complete meal, and can be ready in about an hour. We started this recipe with the basic Cajun/Creole ingredients known as the "holy trinity", bell peppers, onion and celery. (Using the yellow and green peppers adds beautiful color to the dish.) Next, we added lightly seasoned shrimp and pieces of Swai fish fillets to the chowder. If you are not familiar with Swai, it is a type of catfish that has a light, sweet flavor. It is also ideal for this type of seafood chowder because it absorbs the flavors of the soup nicely and it holds together very well while cooking. If you cannot locate Swai at your local market, you can also substitute catfish or another firm type of fish. We did keep this chowder a little on the "mildly spicy" side since the kids were eating this also, but if you prefer a bit more spice, just add a little cayenne pepper and paprika to the shrimp seasoning. You could also add just a dash of Tabasco Sauce to give it even more zing. Be sure to serve some crusty French bread on the side so you can soak up all of the juices! Enjoy!! Heat olive oil in a large soup pot, over medium heat. Add onion, peppers, celery and garlic and saute 5 minutes. Add the seasoned shrimp to the pot and saute for 5 minutes, stirring frequently. Add tomatoes, tomato sauce, white wine, salt, pepper, thyme and parsley to the pot, bring the mixture to a boil, then reduce heat to a simmer and cook for 10 minutes. Add the Worcestershire sauce to the pot and stir, then carefully place the Swai fillets on top of the soup, gently pressing the pieces down into the juices. Cook for about 8-10 minutes over medium-low heat or until the fish is cooked through and opaque in color. Ladle soup over a scoop of cooked brown rice and garnish with chopped green onions and fresh parsley. Serve with a loaf of crusty french bread and a glass of red wine.